Peter Grant of Banbury sent the following letter about his relatives who lived at Dulax as well as the photo of the Crawford’s Gravestone. "Peter Crawford was only 38 years old when he died. He went away over the hill looking for some sheep and a snowstorm came on. By then he must have been near Glenbuckat. His uncle lived there so he was taken there in a state of near collapse. He died of pneumonia. No antibiotics in those days." He was the grandson of the Peter Crawford who was farming at Dulax at the 1841 census. That Peter Crawford had a son who predeceased him, also Peter and the father of Peter the shepherd, and a second son (James) who had either died or moved away by 1881, so the uncle to whose house he was taken may have been maternal (his wife's maiden name was Begg). Peter the shepherd was evidently orphaned at a very early age, to judge by the dates on the family memorial, which may well be why he did not continue the family tradition at Dulax. He left a wife (nee Isabella Reid) and five young daughters, the eldest aged about eleven. She continued living in the house at Delhandy, even after all the daughters had moved away, until at least about 1920. Isobel told me that the Forbses at the Castle of Newe were very good to them and Lady Forbes was instrumental in getting four of the girls started in life with training as children's nurses, a housekeeper and a missionary. Source Citation: Parish: Glenbuchat; ED: 3; Page: 7; Line: 1149; Roll: ; Year: 1841. “On the following day the royal party left Holyrood and travelled to Balmoral. The Queen, with the Prince and her children, and the Duchess of Kent, with her son and grandson, were at the great gala of the district, the Braemar gathering, where the honour of her Majesty's presence is always eagerly craved. Another amusement was the ‘leistering’, or spearing, of salmon in the Dee. Captain Forbes of Newe, and from forty to fifty of his clan, on their return to Strathdon from the Braemar gathering, were attracted by the fishing to the river's edge, when they were carried over the water on the backs of the Queen's men, who volunteered the service, "Macdonald, at their head, carrying Captain Forbes on his back." The courteous act, which was quite spontaneous, charmed the Queen and the Prince. The latter in writing to Germany gave further details of the incident. "Our people in the Highlands are altogether primitive, true-hearted and without guile.... Yesterday the Forbeses of Strath Don passed through here. When they came to the Dee our people (of Strath Dee) offered to carry them across the river, and did so, whereupon they drank to the health of Victoria and the inmates of Balmoral in whisky (schnapps), but as there was no cup to be had, their chief, Captain Forbes, pulled off his shoe, and he and his fifty men drank out of it." The Forbeses got permission to march through the grounds of Balmoral, "the pipers going, in front. They stopped and cheered three times three, throwing up their bonnets." The Queen describes the characteristic demonstration, and she then mentions listening with pleasure "to the distant shouts and the sound of the pibroch." 1 Now Sir Charles Forbes, of Castle Newe. 2 A work shortly to be published, entitled Highlanders of Scot/and, by Kenneth Macleay, Esq., R.S.A., contains excellent portraits of some of the men of these and other of the principal Highland clans, as well as of the Retainers of the Royal Household. 3 One of the keepers since 1851 : an excellent, intelligent man, much liked by the Prince. He, like many others, spit blood after running the race up that steep hill in this short space of time, and he has never been so strong since. The running up hill has in consequence been discontinued. He lives in a cottage at the back of Craig Gowan (commanding a beautiful view) called Robrech, which the Prince built for him. or nineteen started, and it looked very pretty to see them run off in their different coloured kilts, with their white shirts (the jackets or doublets they take off for all the games), and scramble up through the wood, emerging gradually at the edge of it, and climbing the hill. After this we went into the castle, and saw some dancing; the prettiest was a reel by Mr. Farquharson's children and some other children, and the " Ghillie Callum" beautifully danced by John Athole Farquharson, the fourth son. The twelve children were all there, including the baby, who is two years old. Mama, Charles, and Ernest joined us at Braemar. Mama enjoys it all very much : it is her first visit to Scotland. We left after the dancing. We walked with Charles, the boys, and Vicky to the river side above the bridge, where all our tenants were assembled with poles and spears, or rather " leisters," for catching salmon. They all went into the river, walking up it, and then back again, poking about under all the stones to bring fish up to where the men stood with the net. It had a very pretty effect; about one hundred men wading through the river, some in kilts with poles and spears, all very much excited. Not succeeding the first time, we went higher up, and moved to three or four different places, but did not get any salmon ; one or two escaping. Albert stood on a stone, and Colonel Gordon and Lord James Murray waded about the whole time. Duncan, in-spite of all his exertions yesterday, and having besides walked to and from the Gathering, was the whole time in the water. Not far from the laundry there was another trial, and here we had a great fright. In one place there was a very deep pool, into which two men very foolishly went, and one could not swim; we suddenly saw them sink, and in one moment they seemed drowning, though surrounded by people. There was a cry for help, and a general rush, including Albert, towards the spot, which frightened me so much, that I grasped Lord Carlisle's arm in great agony. However, Dr. Robertson(1) swam in and pulled the man out, and all was safely over; but it was a horrid moment. A salmon was speared here by one of the men; after which we walked to the ford, or quarry, where we were very successful, seven salmon being caught, some in the net, and some speared. Though Albert stood in the water some time, he caught nothing : but the scene at this beautiful spot was exciting and picturesque in the extreme. I wished for Landseer's pencil. The sun was intensely hot. We did not get back till after three o'clock, and then took luncheon. The Duchess of Gordon came to see us afterwards; and while she was still with us, Captain Forbes (who had asked permission to do so) marched through the grounds with his men, the pipers going in front. They stopped, and cheered three-times-three, throwing up their bonnets. They then marched off; and we listened with pleasure to the distant shouts and the sound of the pibroch. We heard afterwards that our men had carried all Captain Forbes's men on their backs through the river. They saw the fishing going on, and came to the water's edge on the opposite side; and on being greeted by our people, said they would come over, on which ours went across in one moment and carried them over—Macdonald at their head carrying Captain Forbes on his back. This was very courteous, and worthy of chivalrous times. 1 The gentleman who has had from the beginning the entire management of our property at Balmoral, &c. He is highly esteemed, and is a most amiable man, who has carried out all the Prince's and my wishes admirably. 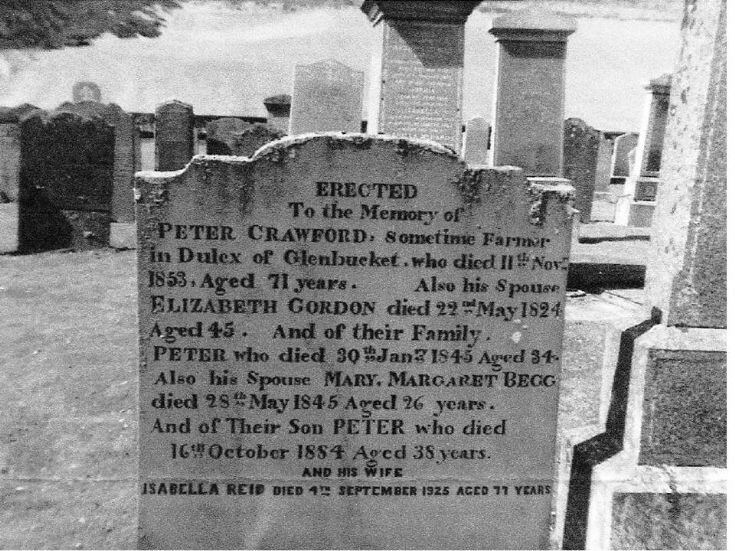 Thanks for sharing the photo of the headstone for Peter Crawford. You mentioned that it had been scoured and re-lettered and I was wondering if anyone has a photo of the headstone before it was relettered? Reason I ask is that the death dates of Peter and wife May in 1845 are obviously wrong because their marriage and births of their children are after their death dates.